Not all Kenyan athletes have vehicles to use in their long runs, but they still find ways to do it. Below are four typical ways in which most of the Kenyan athletes do their long runs. Where there is a will; there is always a way. Firstly, there are a number of well-established athletic managements in the country who have some organized camps where their athletes do their training programs in large groups. These managements include the Gianni Demadonna's and Dr. Rosa and Associates, among others. Athletes in these groups have pickup trucks that take them for their long runs where water is supplied in bottles after every five kilometers and the coaches are in the vehicle to update them on their pace schedules as they run. The vehicles also help carry athletes who give up before the end of the long run. It is the best way to go for a long run, but not all athletes in Kenya get this privilege. Secondly, some athletes who are financially well off but are not in any of the big groups, either because they prefer to be so, or because they are in managements that have few athletes in the country, also get to enjoy their long runs because they have personal vehicles to take them individually. Some can hire a driver while others can have their spouses drive and give them water on their runs. This is the most flexible group in that athletes can easily travel to their desired place of training at their convenient time. The athletes can finish their long run anywhere and visit a restaurant for refreshments without worrying so much about the inconveniences that can be found in the larger groups. 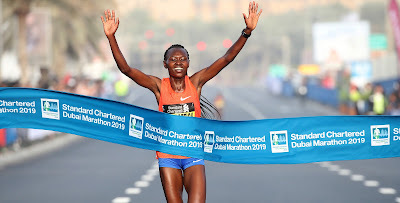 Thirdly, most Kenyan athletes do not own vehicles and have to find a way to train hard in order to get recognition in this competitive sport, and the lack of vehicle to use during the long runs does not stop them. One or two athletes may hire a motorcycle rider to carry water for them and if the rider happens to be a coach, then the better for them. Fourthly, even without any vehicle to use, many other Kenyan athletes have devised ways to go for their long runs that exceed 38km. They chart a route that start and end near to their residences. Also, for the first one hour into their long runs, they carry small plastic bottles or bags of water, clenched in their fists, in which they will drink the water and discard them before the pace picks up. But with the fact that most of the long runs start early in the morning when it is chilly, holding the water bottles while at the same time wearing light clothing fit for a long run is not a nice experience. The only advantage with this kind of long run is that the athletes have to finish it because there are no vehicles to hop into when one feels some discomfort. One gets to train mentally to finish a race. Almost each and every seasoned Kenyan athlete has had to go for a long run using each of the above methods at some point in their career. In all these long runs, it is always advisable to put some money in your pockets just in case of anything. You can get lost, injured, or if in a group of professional athletes from the big camps may be left behind very early in the run and the driver fails to notice you. If it is a 45km long run for example, then you definitely will find it hard to get back to camp on your own, especially if the vehicles had ferried the athletes to do the long run in a place far from the camp, say some other 40km away! Will Asbel Kiprop get banned, or not?